Aftermarket Moto Mirror remote control mirrors are available from truck dealers and independent parts distributors. For original equipment quality at lower prices, order standard aftermarket Moto Mirror brand remote control mirrors made with quick-snap connectors. The following installation instructions describe an aftermarket installation that is equal to original equipment quality. Please refer to the Wiring Diagram when replacing an original equipment mirror with an aftermarket Moto Mirror remote control mirror. All Moto Mirror products must be mounted so that the wire harness exits the bottom of the mirror. Mounting the mirror upside down can lead to mirror failure and voids the mirror warranty. Position the mirror in bracket straight up and down as shown in the Installation Diagram. Brackets and convex mirrors should be adjusted so they do not impede rotation of the mirror. OEM mirror brackets that feature a breakaway "C" bracket can cause particular problems if they are pulled back toward the mirror, blocking its rotation. This "C" bracket should be at a 90 degree angle to the side of the truck and tightened sufficiently to prevent "C" bracket movement in the case of a door slam. Tighten nuts on top and bottom shafts using two 9/16 wrenches. Nuts must be tight for mirror to turn and avoid vibration. Use only hardware provided - Do not use flat washers. Tighten unpinned hex nuts to 15 ft. lbs. ± 2 lbs. Locate the position in the door or cowling for the cable access hole. Remove the interior door panel if needed. Drill a 9/16 inch hole and install one of the supplied grommets. Pull the mirror cable through the grommet. If the access hole is in the door, a hole must be drilled in the door and door jam directly across from each other so the cable can be routed through the door jam. Install the supplied grommets in each hole in the door and door jam. Remove the dash panel(s) required to rout cable behind dash. Pull the cable through the grommets in the door jam and continue routing wire behind dash. Secure the mirror head cable to the truck mirror bracket using the supplied tie wraps. Leave enough slack in cable between mirror head and the first tie wrap on the mirror bracket to allow rotation of mirror without pulling cable. Select a position convenient to driver's hand to install switches. Drill two 1/2'' holes in dash panel. Insert switches in holes, place the supplied switch 'identification plates on switch posts and tighten lock nuts down on both I.D. plates. Route switch cable to meet mirror cable. Connect like colored wires from, each cable using the snap-on connectors. 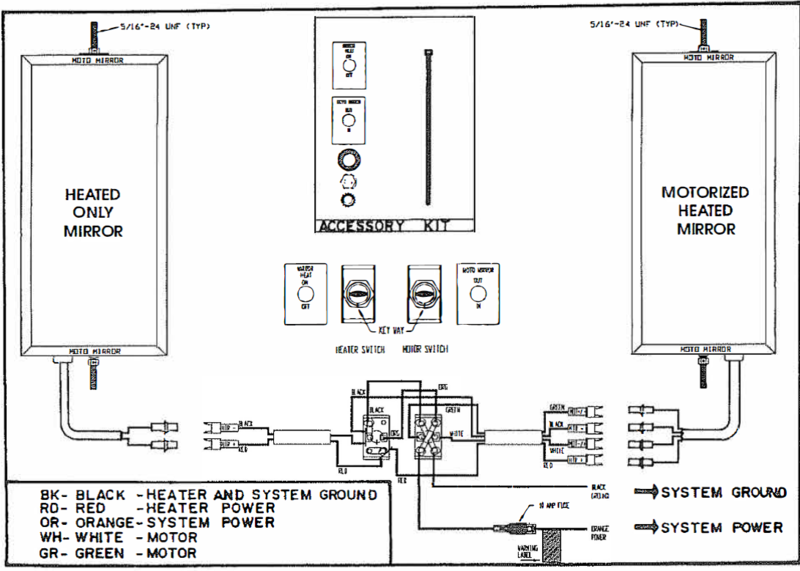 See Wiring Diagram. Connect the BLACK system ground lead from motor switch to the ground bar behind dash. See the Wiring Diagram. Turn the ignition and heater switch to the "ON" position. The heater switch should be lighted when in the "ON" position. Wait 2 - 3 minutes then touch mirror glass to check for heat. Turn switch to "OUT" position and mirror should turn right. Turn switch "IN" position and mirror should turn left. Enough slack must be left in the mirror head cable to avoid pulling or binding cable during rotation. Brackets or convex mirrors should be adjusted so that they do not impede the rotation of the mirror. Open and close the door to be certain that cable will not bind or be cut in door jam. Check grommets for tight fit. Use silicone if needed to provide weather tight seal.